For over 10 years Genea has been providing PGD (pre-implantation genetic diagnosis) & PGS (pre-implantation genetic screening) services in Newcastle for patients from the Hunter, Northern NSW & the Central Coast. We have very experienced scientists trained in embryo biopsy & genetic testing. We work closely with our genetics team at Genea Sydney. Our patients do NOT have to travel to Sydney for their egg collections. 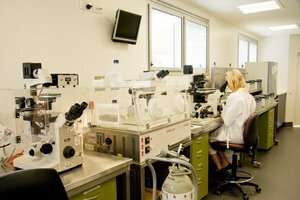 All embryos being tested are biopsied at the lab in Newcastle. We have been doing chromosomal screening of embryos (GeneSure) for many years. Genea is always looking for the most advanced technology we can utilize to provide the best outcomes for our patients. During your cycle of IVF a scientist will select an embryo for transfer based on its appearance. This does not guarantee the normality of that embryo. At least 50% of embryos that look normal under the microscope actually have significant chromosomal issues. Usually an embryo with a chromosomal abnormality will not implant (negative pregnancy test) or will miscarry. On some occasions these pregnancies develop beyond 10 weeks & can be detected using prenatal testing. Some couples opt to have their embryos tested (pre-implantation genetic screening or PGS) with genetic technology called next generation sequencing to exclude embryos with significant chromosomal errors. Current evidence is that this screening will reduce the risk of miscarriage & allow us to better select the embryo most likely to implant (higher chance of pregnancy per embryo transfer). For some couples this may mean less embryo transfers are required in order to achieve a healthy baby. It also avoids the need for a pregnancy termination for a baby affected by Down syndrome. If this is something you would like to consider please make an appointment to discuss with one of our doctors.